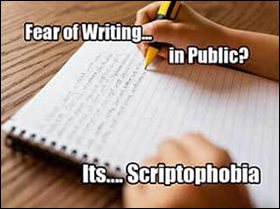 Scriptophobia is a social anxiety disorder, which can simply be described as an extreme -- and generally irrational -- fear of writing in public. Similar to other social anxiety disorders which result in avoidance of social situations, Scriptophobia may start in childhood/adolescence, because of certain factors like social traumas or embarrassments. Sometimes, this disorder may also be accompanied by other anxiety disorders or depression. The term ‘Scriptophobia’ is derived from a combination of Latin word ‘script’ which means ‘writing;’ and Greek word ‘phobos’ which means ‘fear’ or ‘dread.’ Scriptophobia can affect men and women equally. Like most other phobias/fears, Scriptophobia is also a result of a subconscious overprotection mechanism. The phobia may usually get triggered due to an unresolved emotional conflict, a negative experience in the past, a deep-seated lack of self-esteem, or the fear of bullying/maltreatment by others. Interestingly, one of the possible causes of this fear of writing can also be a fear of excess success. People suffering from Scriptophobia are afraid of ridicule, criticism, rejection, and embarrassment. As such, in some cases, the disorder may have an adverse effect on the day-to-day lives of the sufferers. In students, in particular, Scriptophobia can be debilitating because it can lead to panic attacks each time the sufferer has to write in the class. The phobia may, therefore, hinder an affected student’s progress in school and have an impact on his/her scholarly achievements. Some students may even give up education because of this fear of writing. Scriptophobia can sometimes lead to a related disorder called ‘Graphophobia,’ in which the affected individuals develop a strange complex which makes them feel afraid of writing down their personal thoughts. Such individuals may feel that their writing may have devastating outcomes because their innermost thoughts may get exposed. Patients suffering from Scriptophobia may show diverse physical and emotional indications of the disorder, depending on the extent to which they fear writing. Some patients may avoid writing altogether, while others may become excessively guarded or particular about what they write. Scriptophobia may cause an affected individual, especially children, to feel continually depressed, isolated, and anxious. Most children suffering from Scriptophobia may develop some other fears as well. They may be scared of sleeping alone or develop a tendency to remain lonely, or may have imaginary friends. Some children might even experience bed-wetting due to this fear of writing. For treating Scriptophobia, doctors usually depend on three types of anti-anxiety drugs --- benzodiazepines, anti-depressants and beta-blockers. In addition some of the other treatment methods for managing this fear of writing may include Cognitive Behavior Therapy (CBT), Cognitive Therapy (CT), Habit Strategies To Relax, Hypnotherapy, Psychotherapy, Group Therapy, Energy Psychology, In Vivo Exposure, Response Prevention, and Meditation. The use of therapies is specifically important for the treatment of Scriptophobia in younger patients. Besides anti-anxiety medications and therapies, Scriptophobia can also be effectively managed in a natural manner, with the help of some excellent herbal products prepared by renowned Ayurveda experts at Planet Ayurveda herbal manufacturing company. These products are prepared from 100% pure herbs and natural components. A combination of extremely beneficial herbal components is used for the preparation of these capsules, which are useful in managing a number of health conditions. The herbal components of the capsules include Giloy satva (extract of Tinospora cordifolia), Praval Pishti (Coral Calcium), Mukta Pishti (Pearl Calcium), Akik Pishti (Agate Calcium), Jawar Mohra Pishti (an Ayurvedic Calcium compound), and Kamdhudha Ras (an Ayurvedic Calcium compound). The benefits of these capsules in managing Scriptophobia include their ability to balance the ‘Pitta’ dosha of the body, reduce anxiety, boost the immune system, support the digestive system, purify the blood, control blood pressure, relieve muscular cramps, and cure ulcers, acidity, and several other conditions. The herbs which are combined for preparing these capsules include Ashwagandha (Withania somnifera), Tagar (Valleriana wallichi), Brahmi (Bacopa Monneiri), and Jatamansi (Nordostachyes jatamansi). The use of these capsules is beneficial for the patients suffering from Scriptophobia because of the ability of the herbal ingredients to manage disorders of the nervous system, relieve stress/anxiety, control blood pressure, soothe the nerves, enhance mental capabilities, treat depression, improve retention, and balance the body’s ‘Vata’ dosha. The key ingredient used for the preparation of these capsules is the standardized extract of the ‘Ashwagandha’ herb (Withania somnifera). The potent herb is known in Ayurveda for its anti-inflammatory properties and its immense medicinal significance. Patients suffering from Scriptophobia can benefit from the use of these capsules because the herbal components have proven abilities to improve brain function, support nerve functions, improve overall mental health, reduce hypertension, manage inflammation, rejuvenate the body, enhance heart health, reduce metabolic imbalances, strengthen the muscles, and balance the ‘Vata’ and ‘Pitta’ doshas. 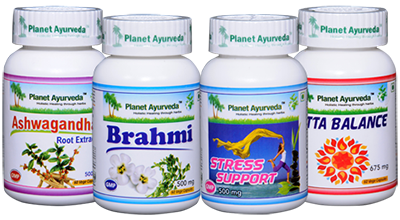 The preparation of these capsules involves the use of the standardized extracts of ‘Brahmi’ (Bacopa Monneiri) herb, which great therapeutic value. The herb is also believed to be an excellent aphrodisiac, memory enhancer, and overall health tonic. The use of the capsules is beneficial in managing the symptoms of Scriptophobia because they can promote mental health, reduce stress/anxiety, boost the immune system, relieve inflammatory conditions, control blood pressure, and eradicate free radicals from the body. Planet Ayurveda's herbal products for the management of Scriptophobia are 100% vegetarian formulations, which have been prepared from pure and natural herbs. The preparation of these products does not involve the use of any chemicals, artificial colors, preservatives, binders, fillers or additives.